Christenings are a special occasion for every family and will be remembered for years to come. If you’re due to attend one of the ceremonies in the near future, then it is crucial you have a gift prepared for the baby. While you could opt for a standard present idea, like a bracelet or toy, if you’re close with the parents then it might be worth producing something more special, why not make a christening robe for their child to wear on the big day? This is typically what infants are dressed in at their Christening, as it is keeping with tradition but it also makes them look adorable! Even if you’re on a tight budget, that doesn’t mean you need to compromise on quality for the child’s dress. You can still provide them with a gorgeous robe, by making it yourself. 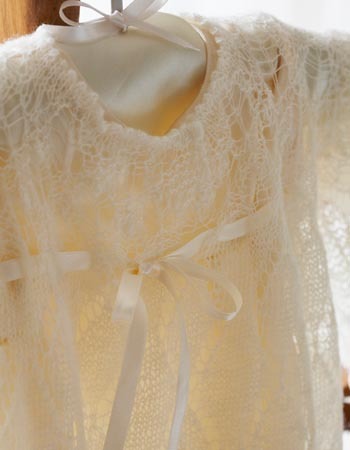 Our beautiful Christening robe would be perfect for your friends’ baby and the love you put into knitting it will make it extra personal and memorable. It has a round neck with a front opening, while the sleeves are set-in. Furthermore, you can use a variety of different lace patterns to tailor it to your creative vision and the baby’s personality. One word of warning – it does require a skilled knitter to make it, so if you’re still getting to grips with the hobby you may want to get some help from an expert! The robe is designed to fit infants between the ages of three to nine months, so before you get started think about how old the little one will be at the time of the Christening. You’re bound to receive floods of compliments at the ceremony, both for how gorgeous the baby looks and how talented you are at making the dress using your own resources. Remember to take lots of photos of the child in their robe for the parents’ mantelpiece so they can cherish the memory forever! You can download the pattern for our gorgeous christening robe from the Woman’s Weekly Shop.